If you haven't played Super Hexagon yet you need to put everything down immediately and do so. Your boss, teacher, and/or parents will understand. Unless you're a brain surgeon. Please don't put that scalpel down. It can wait. Super Hexagon—the latest game from the creator of the super-hard VVVVVV that you can find in the iTunes store linked above (or its flash predecessor here)—has been the subject of the past weekend's many conversations in my circle of video game industry friends and colleagues. And for good reason. The weekend fame is partially to do with how simple and yet mind-bogglingly hard the action-puzzle game is at the same time. The game only asks you to survive against an onslaught of obstacles. Don't hit them. Simple enough. Actually executing that is anything but simple. 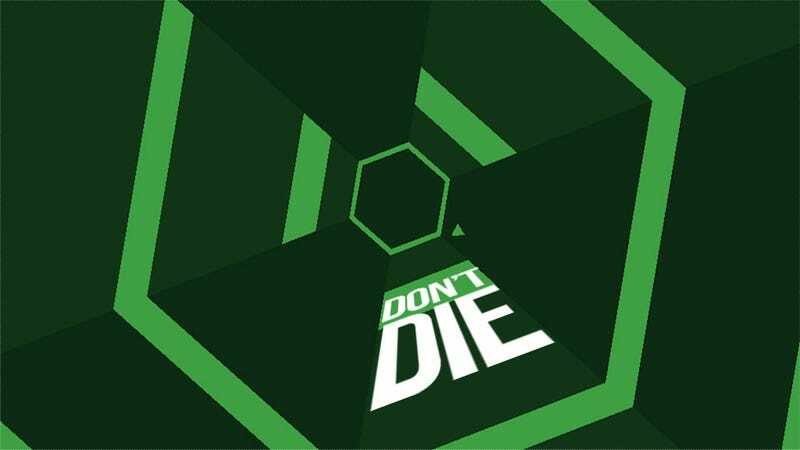 You Probably Can&apos;t Last 30 Seconds In Super Hexagon, But Buy It Anyway. It's addictive, too. And while it might be hard to wrap your head around initially, you can tell from your first few failures that it's just a matter of time and practice before you start getting a good handle on it. So let's skip those first few head-scratchers and get right to the heart of how the game works, complete with tips that should be obvious, but are obscured by the electronicy music and convulsing color changes. Super Hexagon loads up, and your gamer brain registers that you can click on either side of your screen to move a cursor back and forth. Got it. Objects are coming at me. Avoid them. Got it. But if you're too zoned in on what's directly in front of you, you won't notice the patterns that are forming just a few inches around that. The game will start pumping out geometric shapes: squares and hexagons and, later, mazes. If your eyes are scoping the field for what's coming up next, you'll be better prepared to handle it. Don't be afraid to go left even if you're used to going right. If you rely too much on moving your cursor right, you might miss a better window to your left. Switch up your patterns every once in awhile. Get used to having to do that. Because the game will eventually force you to whether you like it or not. Don't be too comfortable with going either right or left. Be comfortable doing both. Contrary to what the pace of the game might make you feel, you can actually pause to think before making a move (until you get to the harder modes, that is). You don't have to be rapidly moving your cursor back and forth. In fact, it will almost assuredly be the death of you. I've escaped the clutches of Super Hexagon's geometric shapes by sometimes not even moving the cursor. At odd moments, your cursor will be in the perfect placement to sneak past multiple obstructions. It gives you more time to plan ahead, allowing you to take my first piece of advice. Super Hexagon's easiest mode is called hard. That's because it's a very, very hard game. But playing around with harder and hardest (and the unlockable hardester and another two levels I can't even fathom) gives you both an appreciation for hard mode as well as faster reflexes and a deeper understanding of the kind of twists, turns and shapes the game is going to throw at you. I know, I know. Blasphemy to some. The music is, after all, pretty rhythmic and can actually help you get in the zone. But maybe that's not working for you. Ignoring the female voice that calls out approaching obstacles might actually be a benefit. I turned the music off to multitask this weekend, and ended up playing far better. Though my success could have just been from all the practice. You won't know until you try. Seriously. The game is dizzying. For the love of science, do not look at the leaderboards. I thought I was pretty proud of hitting 30+ seconds. And then I mocked my friends who hit 30+ when I was rolling around in the 40s. The back and forth banter and friendly competition got me to 60+. But it's hard to get competitive when you consider the black hole you'd have to jump into to even begin to compete with the many 200+ scores on the leaderboards. Who are all you crazy people?! This sounds like an obvious tip, but you'd be surprised when it comes to Super Hexagon. It's very, very easy to get tripped up in this game. Whether it's a close encounter of getting snagged on a corner, or just confronting a new pattern of lines and shapes you haven't seen before, you will die. Often. I can't stress enough how much you will die. In fact your death will be so frequent you'll come to terms with your real-life mortality. But it's important not to rage quit (unless you're taking my sixth piece of advice) because practicing will let you experience more of the traps the game has to offer. The more practice you get with all of them, the better prepared you'll be to survive for longer lengths of time. Super Hexagon is a game that requires you to adapt to an ever-changing environment. And you have to respond to the changes very quickly. By honing your skills on every obstacle the game throws at you, nothing will come as a surprise. So maybe a lot of these are obvious to you. Maybe you've played the game more than I have and are, in fact, one of the wizards boasting a 200+ score on the leaderboard. Really I just needed another excuse to tell you how awesome Super Hexagon is and encourage you to spend some time with it. Rarely will you find me neglecting my consoles in favor of an iOS game, but Super Hexagon is worth it. And if you have any other tips, please feel free to share.